And so, one thing we might think about is what if we could just insert a quarter-way length line to impedance-match this to something else so that this impedance will look here and here with something higher. Maybe we could impedance-match this to a hundred ohms, and a hundred ohms, and then as we looked in, we now have two parallel 100-ohm resistors, and they would come together to be 50. And that worked a lot better. And so the quarter wavelength can be used to do this, and we could convert RS to 2RS so we can match. But, the problem is even though they’re matched now, the output ports are isolated. This port can still talk to that port. And why this is so important is often times, you want to send a signal coming in this way, and we want to send it this way. What we don’t want to do is to couple the signal from one side to the other. Now just a side note, that if the two signals here are exactly the same, then no current would flow through this middle section because there’s no potential drop. But, if there is any mismatch in the signal at this node or at this node, then we could have currents that might flow between the center. 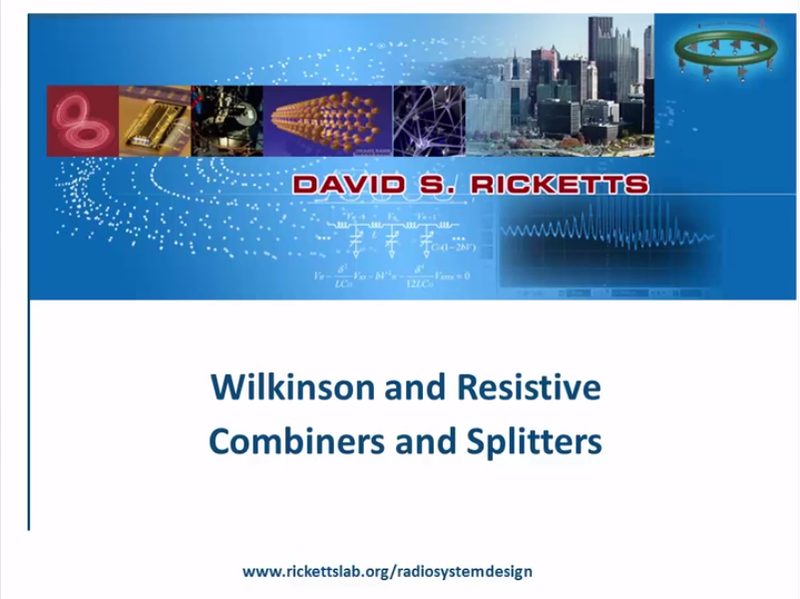 And the solution to this problem is called the Wilkinson Power Combiner. 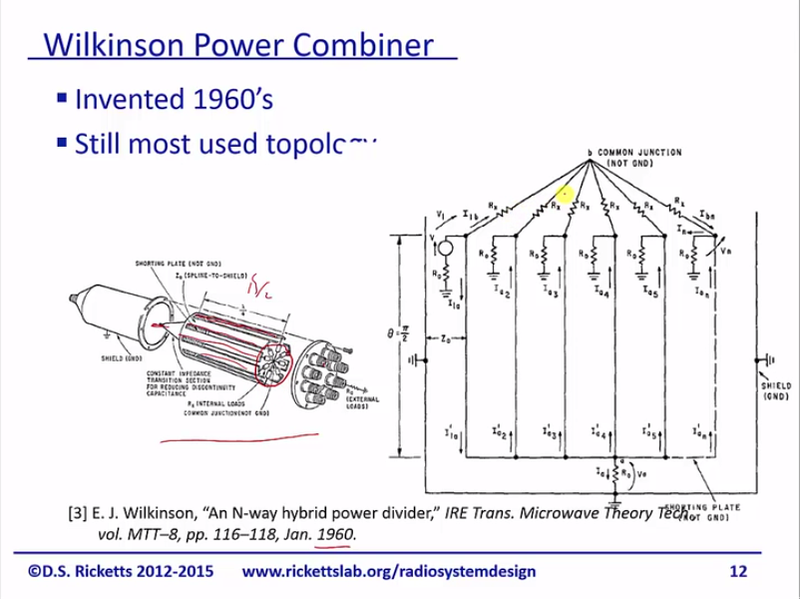 And it was invented in the 1960s and it’s still the most used topology – this is a paper from 1960 and I just love the picture and what he did is he used – this is transmission lines and he put it in a radio configuration with the inputs and these all combine into a single output here. And I just want you to notice that there are these resistors here. 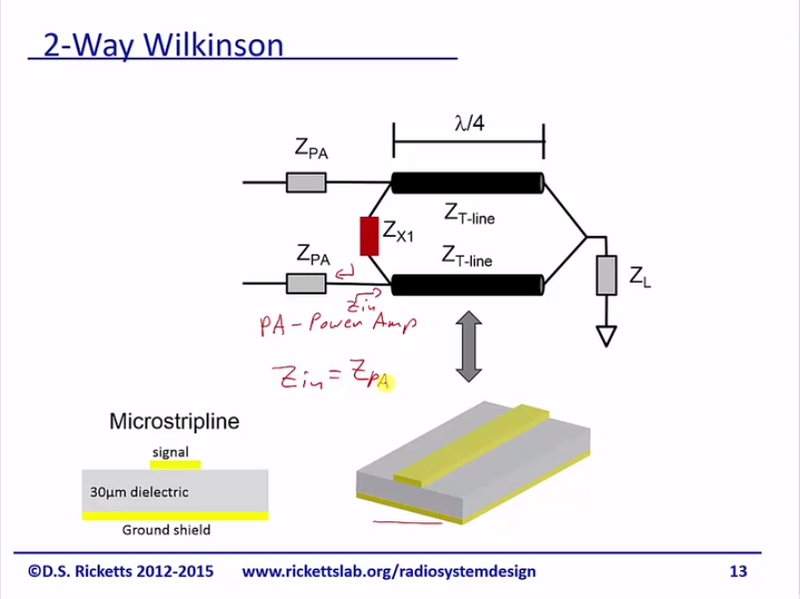 And if we draw the schematic, he basically found the great way to put in these resistors. We’re going to learn what these resistors are for in just a moment, but this is more of a historical lesson than anything else. I apologize and I finished writing that and that is . Alright, I want to take you through a cartoon explanation of a Wilkinson Combiner. And in this example, we’re going to assume we’re doing microstructure transmission lines and we have some source impedance. In this example, we use a PA, which stands for “Power Amplifier”. What I want is for my input impedance is to look exactly like my PA impedance so that they are impedance-matched in this example. So, I’m going to target my Zin and I want my Zin to be equal to my ZPA. So, that’s my guidelines and I want to figure out how can I build my combiner because you may not know anything, but you can say, “Okay, I’ve got a signal coming in at the top, a signal coming in from the bottom, and somehow, they combine into this node.” But, what we’re going to do is we’re going to look at how they combine and also how well they are isolated from one another. 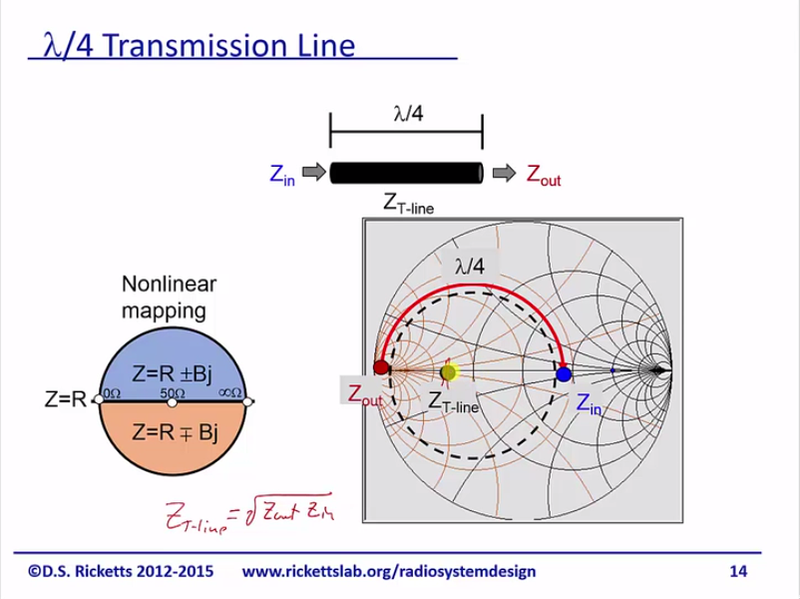 [Slide] A quick reminder that the quarter wavelength transformer takes us from one side of the Smith Chart to the other. So, if I start with the output impedance here and I have a transmission line, it’s going to rotate around in a quarter wavelength to the other side. And don’t forget that this ZT-line is the geometric mean of Zout and Zin. So, it’s not in the center; it’s off to the side here, but this will take us from Zout to Zin and the reason why I show you this is – I’ll just move back real quick – you can see that we’re using transmission lines, so we’ll go through real quick. 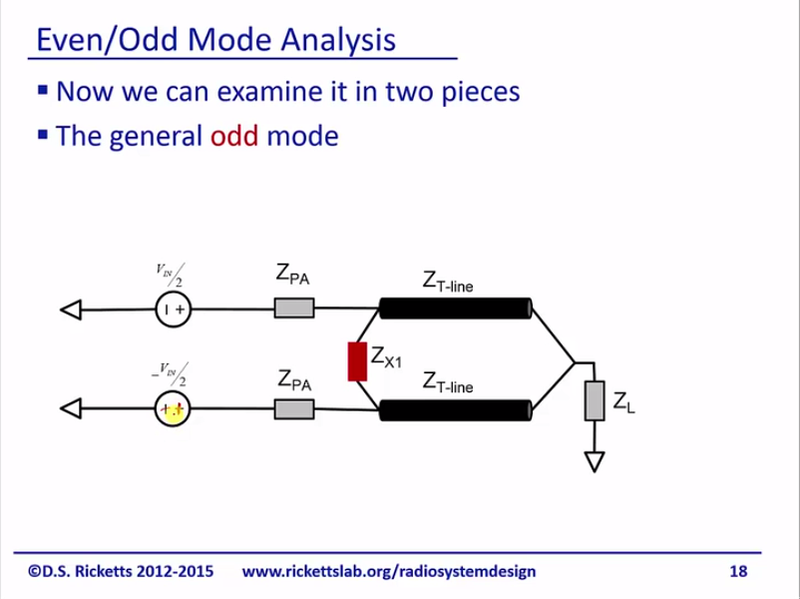 Alright, so now I want to talk about a concept called Even/Odd Mode Analysis. This is one of these examples where we have an analysis technique that’s well-suited to solve these transmission line problems and so I want to introduce it here. And you use it more often in transmission lines in some other systems, but it’s pretty unique – I won’t say unique, but it’s applicable everywhere and it’s used in RF because it solves some easy derivations for us or some difficult derivations for us. 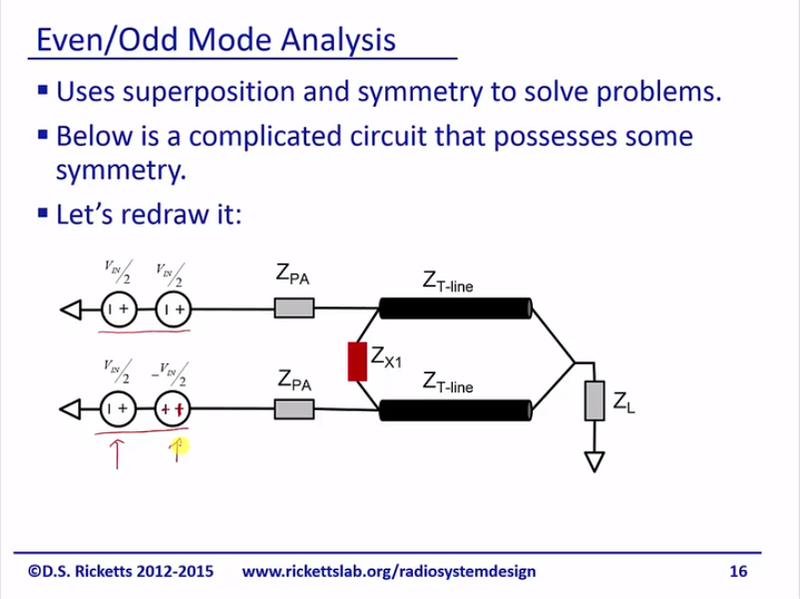 So, the Even/Odd Mode Analysis uses superposition and symmetry to solve complex problems. So, below is an example of a complicated circuit that possesses some symmetry. The symmetry you can see is right here, but we want to figure out this, first of all, what the input impedance looks like here, and we also want to find out what the isolation is between these. And ideally, we want to find S Parameters. If I were to take this and just write a box, I’d like to figure out where the S Parameters are in that box. So, what we are going to do is to redraw this in an Even/Odd Mode Analysis. So what I’ve done here is to split VIN into two sources and I apologize – this should be a plus and this should be a minus. Here, I’ve taken my ground and I’ve just split it into two sources of +VIN/2 and -VIN. And the reason I did that is I’ve got these two sources and I’ve got these two sources. And because it’s a linear system, I could just look at the superposition of the effect of each set of sources. And so, let’s take a look at what is called the general even mode, where I’ve selected the in-phase component of these two and I want to see how they look. I can also look at the outer phase or odd mode by looking at the – once again, I should turn that around – this is negative – of the supply. I guess technically, I’m correct. This is the minus voltage here, but for me pictorially, it looks better that way. Alright, let’s go ahead and analyze this. 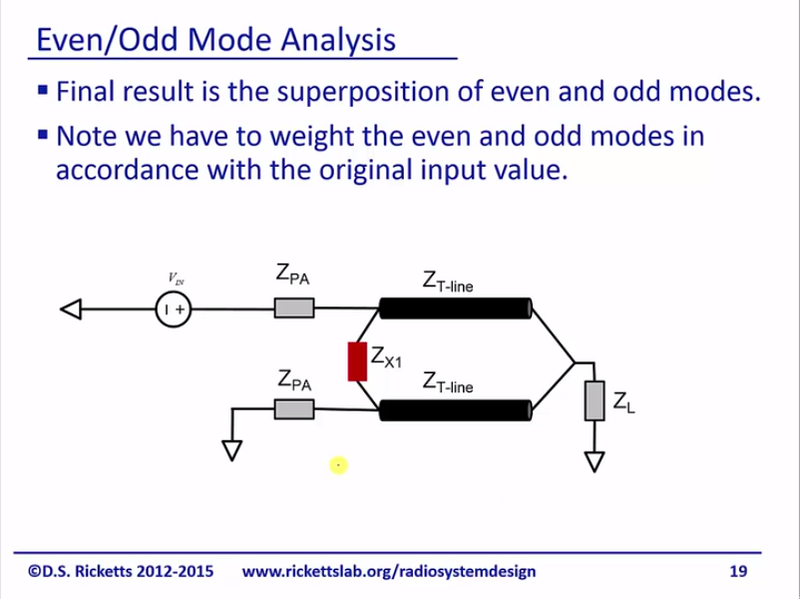 The final result is going to be a superposition of even and odd modes and you just have to note that when you want to actually solve the problem, you actually have to figure out how much of an even and odd mode your input signal has. But in our analysis to come, we’re just going to find out the general solution so we can find the S Parameters of two-port network. In this specific example, the amplitudes of even and odd are the same because they sum up to be the ground and sum up to be VIN here at the end or beginning. 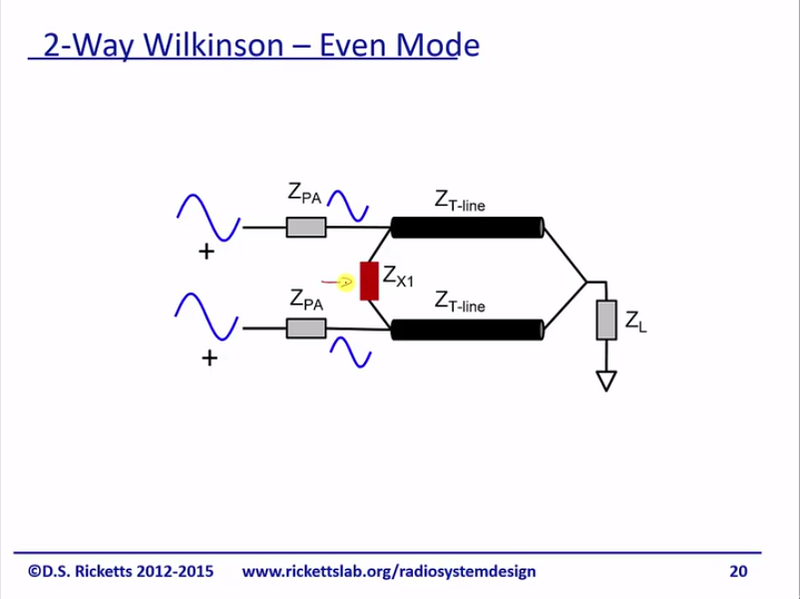 … And model those simply as a transmission line with half the characteristic impedance and I could find the relationship between ZL and ZPA and find out the transmission line characteristic impedance that I need to match ZPA to ZL. And you can see here, it’s pretty simple and in even modes, the two signals simply combine. So, this is a great power combiner. Now take a look at the odd mode. So, we’re looking at out-of-phase signals here, we’ve got out-of-phase signals there, and because they’re out-of-phase, if you look at it, you can notice there’s a symmetry right down at the center. And we can think about a virtual ground in the middle of the resistor and here at the end and what we can do is actually split this into two separate circuits and I hope by now, you’re starting to see Even/Odd Mode Analysis is good because when circuits have symmetry, we can find these virtual grounds or virtual opens and separate them out. And now, we have a very tractable problem here that doesn’t involve anything on the top. Don’t forget that if we got a short, that’s going to be an open so that reduces even further to simply, here. So for the Odd Mode, we want to set ZX1 equal to 2ZPA so that these two are impedance-matched at the Odd Modes. 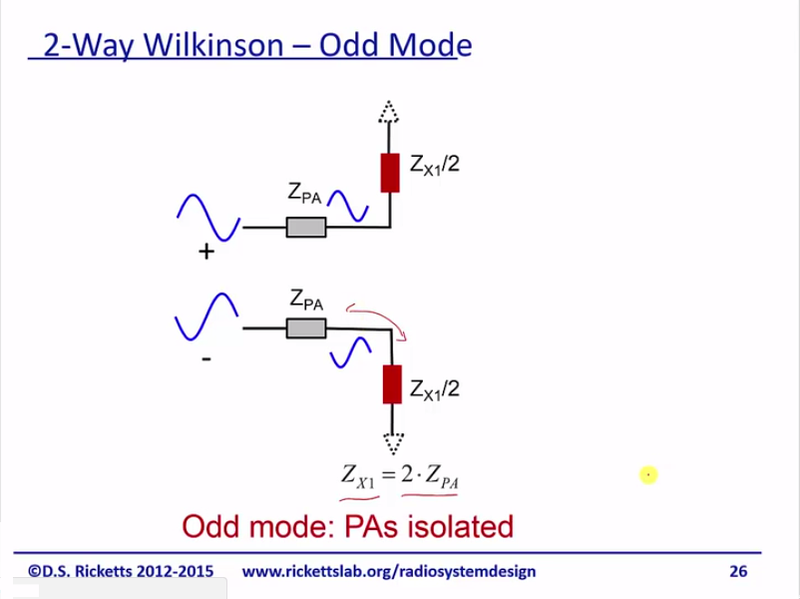 So in Odd Modes, the two PAs or two inputs are completely isolated from one another. 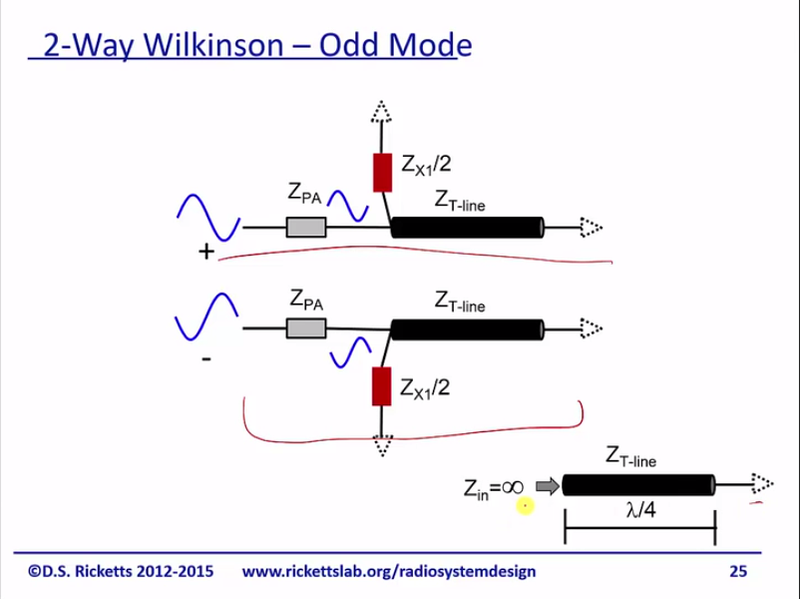 So the Odd Mode showed us how to pick this resistor value so the totally isolated and Even Mode showed us how to design the transmission line so we get the ideal ZIN and the powers combined. And so, our final solution here is to put a resistor between these two; that’s what I’ve shown in the previous slide – Let us come back here a little bit real quick. This is a resistor; the balance resistor is what I call it. So, we can put this balance resistor and here’s a great 3-D picture of a Wilkinson Power/Combiner with co-action cables, where you can see that they’ve attached a little resistor here between the two transmission lines. And I’ve written here the S- Matrix and we haven’t seen S-Matrixes beyond two by two, but it’s pretty easy. Just to remember from your basic linear algebra, this is 11, 12, and 13. This is 21, 22, and 23. Right, this is 33. So the first thing we can see is that without much effort, S11, S22, and S33 are all 0 and that means we’re perfectly impedance-matched, and that’s great. The other thing we can see is that we have an even split between ports 1 and 2, and we have a split here between ports 1 and 3. Don’t forget we have the square root of 2 at front. The S Parameters tell us voltage, and don’t forget power is V squared (P = V2) so that the square root of 2 will turn into 1/2 and we’ll have our power derived. So, isolation can be achieved by injecting the same signal which leaks from port 2 to port 3. This is what this resistor does for isolation and the setting up of this correct value allows the amplitude phase to be correct for what we made. Alright, so that’s how we build the transmission line, but if we just go back here as I mentioned before this is all tied to , which makes it a kind of narrow-band. Sometimes, we want to make a broadband power combiner or splitter, and we may not be doing to necessarily be the most efficient, but maybe we just want to split two signals in equal amounts. 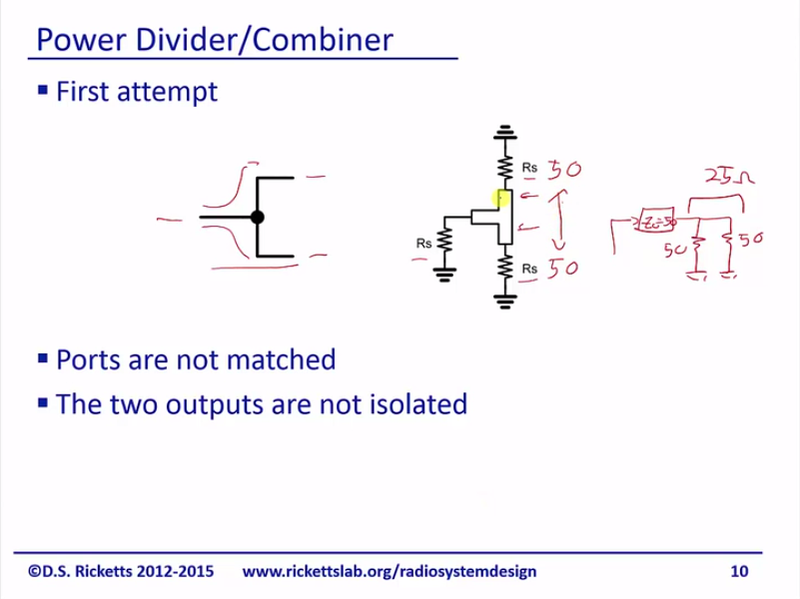 And so the resistor/divider here is a way to do that. And the question is: What should the value of R be? What we do is we set and we’re going to have in parallel, and . And if you calculate the parallel combination of those two, you’ll end up with and as the impedance looking over here, we add , and now, we’re at . And so looking into here, it’s . 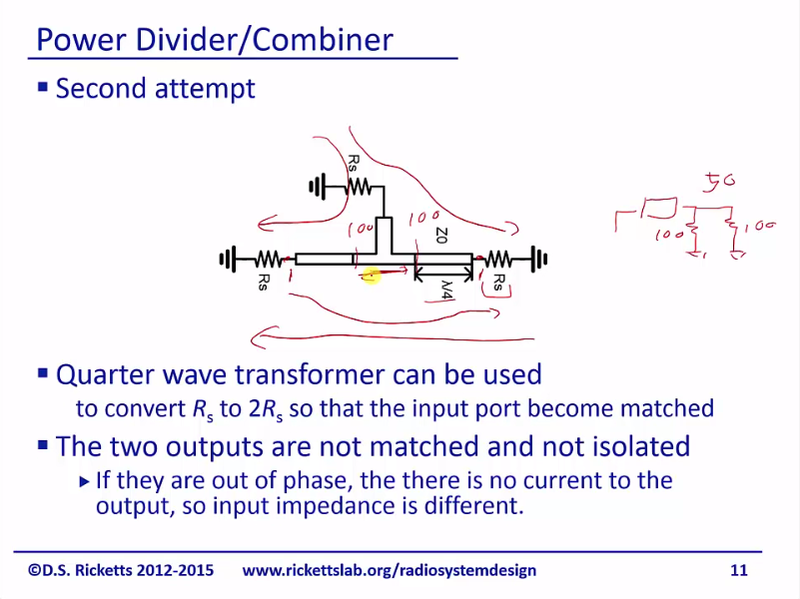 So, the resistor divider/combiner is actually the popular one that we have in our Lab, and it allow us for instance to have a signal divider/combiner from 1 to 10 gigahertz. And the key here is looking into here at every port, I see my 50 ohms, so that my R signals don’t have any reflections. It is very lossy, but that’s not the point of this one. The point of this one is to have broadband. The Wilkinson itself can very little loss, but it’s very narrow band.